Shane Warne, where do I start....... There is no doubt that he is the best leg spinner EVER, in my opinion he is the best bowler ever. He bowls mailny leg breaks and uses the flipper frequently as his deadly finishing move. 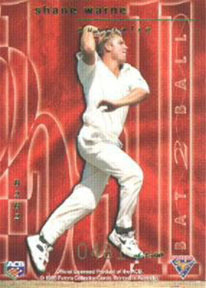 From his debut till 1998 Warne was the most intimidating leg spinner around, but 1998 brought only bad luck for him. He bowled poorly because of shoulder injury against India and had to stay off for six months as he underwent operation. His return was quite unimpressive as he took only 4 wickets in the next 3 tests, and eventually he was dropped from the test dquad even though he was the vice captain. However, Warne, captained the Australian one day team, immediately after his return, and did quite well with the ball and with the brain. Warne's unpredictabilty was the greatest thing about his captaincy. Warne started off the World Cup 1999 with 3 wickets vs Scotland, but then he was hit all over by the Pakistanis and the Kiwis. He improved his performance against the West Indies by adding 3 more wickets, but when Australia reached the Super Sixes, he did not do so well against India or Zimbabwe. In their last match of that round, Warne seemed to return to form. He bowled a delivery 2 feet outside leg stump that spun a long way to hit Hershelle Gibbs' off stump. 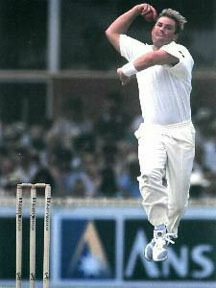 Gibbs would remember this one as the "Ball from Hell" similar to the "Ball of the Century" that Warne bowled on test debut. There was no doubt the king of spin was back. During the semi final, the aussies put up a poor total and the South Africans seemed sure to win. But you know the saying "IT AINT OVER TILL THE FAT BOY SPINS" and indeed he did, with 4 wickets probably the best performance in the tournament. That amazing display of spin bowling was following by another one in the finals, where he simply dominated over the Pakistanis, and grabbed four more. He ended the tournament with 20 wickets a world record equalled with Geoff Allot in the same World Cup. Although, Warne has been involved in many controversies, that includes him reporting that Saleem Malik had bribed him and Mark Waugh to throw a match, and the fact that he and Waugh had accepted money to provide info regarding the pitch in 1993, all that makes him a better performer. He also likes to speak freely despite all restrictions, like the time he said Ranatunga should retire as he was no good for Sri Lanka (which later proved to be right as was seen in World Cup 1999, and NO i do not think hes a psychic). If he can do so well, despite being under all that pressure from the media, I can only imagine how he would do if he had nothing else but cricket to worry about.